Luxury Condo in tropical setting and steps away from breathtaking Penca Beach. Designer finished 2 bedroom, 2 bathroom level entry unit, sleeps 6. Housekeeping included once a week with a weekly rental. Steps away from the white sands of Penca Beach this beautifully finished new ground floor condo offers an escape to the natural beauty of Costa Rica with all the comforts and luxury of a North American resort. Whether relaxing on your private garden terrace listening to monkeys and parrots in the nearby mature forests, or enjoying the relaxation of overlooking the pool and manicured gardens of the complex, you are sure to quickly fall in love with the sights sounds and smells of Costa Rica. There is a few barbecues for your use as well. After a day at the beach or pool, enjoy the flat screen TV or create tropical delights in the fully equipped European style kitchen or simply rejuvenate yourself in the deep jacuzzi tub or shower in one of two monster showers with rainmaker shower heads. Ceiling fans throughout supplement the air conditioned comfort. Charming restaurants, grocery stores are close by. Come and experience the beauty of Costa Rica, the warmth of it's people and the luxury of Casa del Sol. Pura Vida! 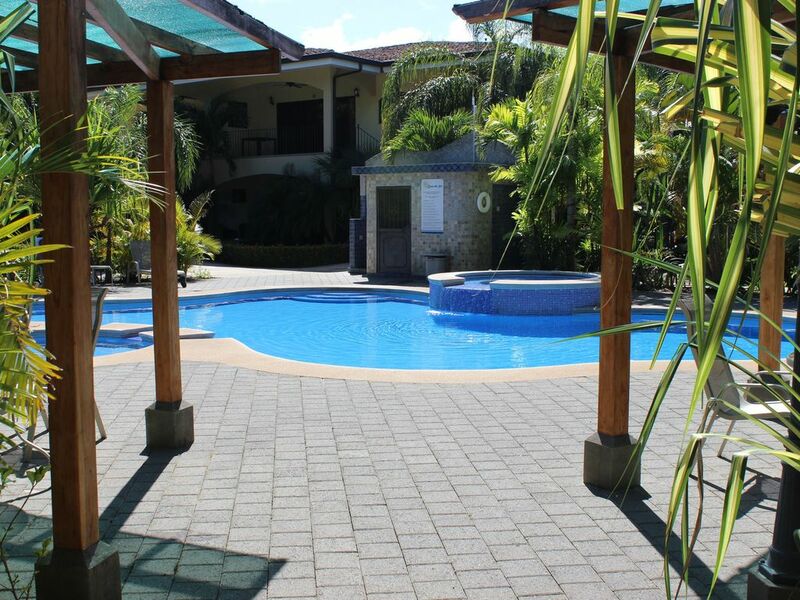 Sites and Attractions: Simply relax on the beautiful grounds of Casa del Sol in the peace and quite of the nearby Costa Rican village of Potrero: where the people are friendly and the shops and services such as internet cafe, restaurants and grocery store are only a short walk away. Explore and enjoy the white sands of Penca Beach. Enjoy deep sea fishing, sunset cruises, beach walks and the services of banking, restaurants, pharmacy, and retail outlets in nearby Flamingo. Venture a little further for world class Golf at Playa Conchal's Robert Trent Jones Jr.Championship Course or seek out the adventure of Zip-line tors, mud baths and jungle walks or white water rafting. Gorgeous marble counter tops with one and two sinks. High quality luxurious towels and bath mats. Rain head showers fully tiled and huge! Deep Jacuzzi tub in Master suite. Beautiful outdoor patio with table&chairs. Absolute favourite spot to have your meals surrounded by stunning tropical gardens and pool. You may be lucky enough to have the monkeys visit nearby. I would highly recommend staying here. The unit is great, pool is quiet and peaceful. Close to beaches, restaurants, groceries. Owners were very accommodating and easy to deal with. We were so comfortable in this condo. It is pleasantly decorated, tucked away in a corner that provided privacy. The master bed was extremely comfortable. Extra touches such as beach chairs and towels really were lovely.,Housekeeping was provided which was well scheduled. The owner went out of her way to answer questions, provide information and to be available by email when needed. We would definitely stay there again. The only issues were a few things that needed repair. We let the owner know and we are positive she will see to them right away. But nothing too important, a tv remote etc, and nothing that interfered with us loving our stay in the condo!! Location to the beach was excellent. The unit had everything we needed in it. We made good use of the pool. Loved the grounds around the complex. All in all had a wonderful time. We loved our few days at this beautiful condo which is a short walk from one of the most beautiful beaches in Costa Rica. My only complaint was when you include the very high cleaning fee and the service fee the per day cost shot up to well over $200 per day. Something to keep in mind. Also VRBO was very slow, almost 2 weeks later, in returning our deposit and had to call them twice. Obviously not the owners fault, they were great and sent very helpful info ahead of time. Excellent place to stay. We stayed 2 weeks and enjoyed every minute of it. The development is well managed, safe, clean, and only 300 meters from one of the best beaches in the area. The property is very peaceful and quiet. I highly recommend this property and would definitely stay again. I have traveled extensively in Central America and Casa del Sol was far and away the best place I have ever stayed. The condo was exceptional and exceeded expectations. It was sparkling clean with all the amenities you would need to cook for a family. A very home-y feel! The beds were exceptionally comfortable and the rooms had a bright and airy feel to them. The pool was a wonderful bonus for the children and adults- very well maintained as was the beautiful, tropical garden. Reynaldo- the friendly man at the security gate- learned all of our names and greeted us warmly whenever we passed through. Penca beach- just up the road- is a white sand paradise. We frequented "Pablo's"- a tiny restaurant right on Penca serving cappuccinos in the morning and sandwiches and beer all day long. For dinner we went to "Sol y Mar" a decently priced restaurant with delicious food. Daphne is a wonderfully attentive host who gave us many helpful suggestions for things to do and places to eat. She responded to all inquiries promptly and helped to make our vacation perfect.